Precision Engineering Corporation has provided quality Civil Engineering services to a diverse client base for more than 35 years. Our qualified staff boasts over 240 years of combined professional experience in Civil & Geotechnical Engineering, Surveying, Land Planning, Site Design, Construction Management, Construction Staking and Construction Materials Testing. Our engineers are registered in MS, TN, AL, AR and LA. Our Surveyors are registered in MS and TN. PEC was selected as the Civil Engineer on the design team for the Pavilion at Ole Miss. PEC also performed full topographic and utility surveys for use in design of the new basketball arena and parking garage. 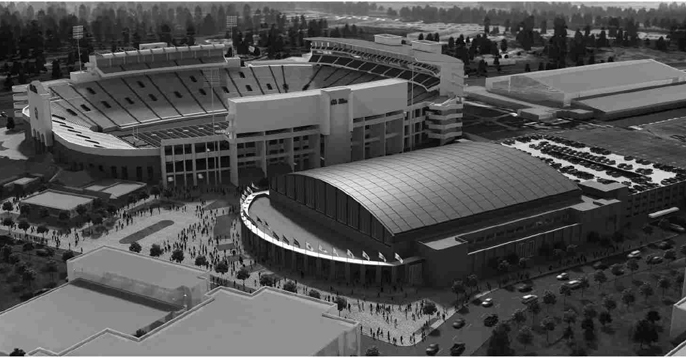 The project includes realignment of Hill Drive, construction of a parking garage with subsurface levels and construction of a new arena. Fitting all of these pieces of the puzzle together has been challenging with the project's location at the heart of the historic campus. 9/21/2016 - OXFORD – Ryland Eugene Sneed, 73, died Thursday, September 1, 2016, at Methodist University Hospital in Germantown, Tennessee. A funeral service will be held Sunday, September 4, 2016, at 2:30 p.m. at North Oxford Baptist Church with the Rev. Johnny Flynt and the Rev. David Bodenheimer officiating. Burial will follow in Union Church of the Nazarene Cemetery. A catered reception and visitation will be held in West Hall at Waller Funeral Home Saturday evening, September 3, 2016, from 4 p.m. until 7 p.m. and beginning at 1:30 p.m. prior to the service on Sunday, September 4, 2016, at the church. Born in Oxford, Mississippi, to the late Oscar Ryland and Hattie Mae Mitchell Sneed, Mr. Sneed was the owner of Precision Engineering was retired from the United States Army where he served as a major. He was a member of North Oxford Baptist Church and of the National Council of Examiners and Engineers. He served on the board of Registered Professional Engineers and Land Surveyors. Mr. Sneed was an avid Ole Miss basketball fan and found great enjoyment working on the family farm. Mr. Sneed is survived by his wife, Peggy Sneed of Oxford, Mississippi; daughters, Heather Sneed McClendon and her husband, Robert, of Oxford, Mississippi, and Allison Sneed, also of Oxford, Mississippi; a son, Patrick Sneed and his wife, Kayla of Oxford, Mississippi; a sister, Jo Hale of New Albany, Mississippi; a brother, Harold Dean Sneed of Pontotoc, Mississippi, and three grandchildren. Memorial contributions in Mr. Sneed's memory may be made to North Oxford Baptist Church, P.O. Box 1700, Oxford, Mississippi 38655 or the Union Church of the Nazarene Cemetery Fund, 95 Holly Lane, Thaxton, MS 38871. In honor of Mr. Sneed's service to our country, the flag of the United States Army will be flown at Waller Funeral Home. 8/21/2015 - PEC would like to welcome Shane Cardwell to our team. Shane is a professional engineer with experience in site design, testing, geotechnical and environmental engineering. Shane has 13 years of experience in since graduation from Ole Miss. 8/21/2015 - PEC would like to welcome Mark Wilkie to our team. Mark will be working in our construction materials testing and geotechnical exploration group.